One of Germany's most popular cities is even more enticing than it was a few years ago, thanks to the Hafencity, the Ballinstadt Emigration Museum, and other new attractions. ABOVE: Hamburg's waterfront on the Elbe. A lively and fascinating harbor. Hamburg is the busiest port in Northern Europe, and it's the leading transfer port for shipments between China and the Baltic. It has a rich maritime tradition, with shipyards, container terminals, canals, and lakes in the heart of the city--and with more bridges (2,300+) than any other city in the world. History, museums, and architecture. 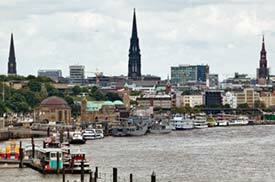 Hamburg was a key member of the Hanseatic League, is dotted with churches and museums, and is the site of HafenCity, the largest inner-city development in Europe. Entertainment and culture. Whether your tastes run to nightclubs, operas and philharmonic concerts, theatre, Beatles tours, or hired hanky-panky in the city's downsized red-light district, Hamburg is ready to offer you a good time. Shopping. Hamburg attracts serious shoppers from throughout Germany, Western Europe, and the East--including Russia, whose millionaires and billionaires come to Hamburg for designer clothing, jewelry, and yachts. Pleasant walks and scenery. Hamburg was voted "European Green Capital" for 2011, and it certainly looks the part: Even in downtown Hamburg, you'll see plenty of trees, and nature-conservation areas make up 8 percent of the city's total space. For tips on what to see and do in Hamburg, go to page 2 of this article. Top photo copyright © Tobias Helbig. 1st inset photo copyright © Björn Kindler. 3rd inset photo © Mirco Kirkstein. 4th inset photo copyright © Arne Thaysen.